When I import the STL file exported from OpenSCAD from the code below into either SketchUp or DesignSpark all faces of the model have two co-planar sections. STL files only store triangles so each face is broken into triangular facets. Darn! but THANKS, nophead. I'll have to work around that behavior. > Darn! but THANKS, nophead. I'll have to work around that behavior. What formats do DesignSpark and SketchUp import which would be able to provide the wanted results? Merging planar triangles into larger faces is something that can be done on import. Such functionality would typically be part of said CAD packages. I would recommend contacting customer support there and inquire about this. Meshmixer is a free program that has an "inspector" feature. I've not intentionally created co-planar triangles, so I can't say that it would correct it, but the price is right. Can someone point me to an authoritative STANDARD for .stl files that says that all facets must consist of a single outerloop and that loop must contain exactly 3 vertices? This is, of course, for ASCII .stl files. >> Darn! but THANKS, nophead. I'll have to work around that behavior. > What formats do DesignSpark and SketchUp import which would be able to provide the wanted results? > Merging planar triangles into larger faces is something that can be done on import. Such functionality would typically be part of said CAD packages. I would recommend contacting customer support there and inquire about this. > Can someone point me to an authoritative STANDARD for .stl files that says that all facets must consist of a single outerloop and that loop must contain exactly 3 vertices? AFAIK, there is no authorative STL standard. 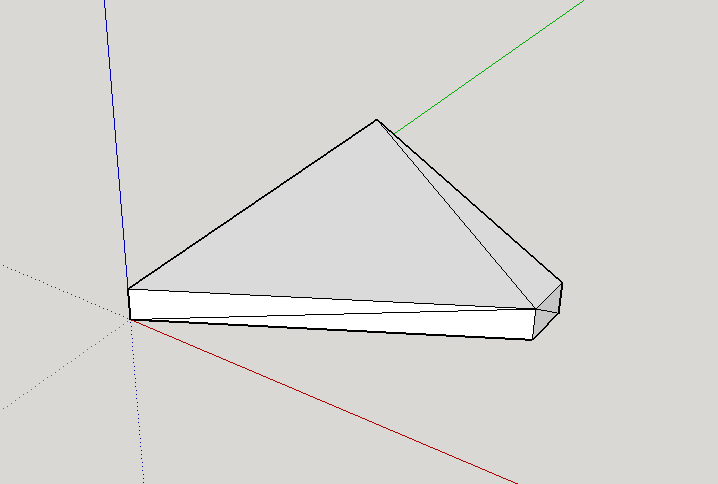 Technically, you could store any size polygon in STL files, but the convention is that it’s only used for triangles. As binary STL doesn’t even have an option for storing other than triangles, that should be a good guideline for what to put in ASCII STL files, to allow bi-directional compatibility. It says an STL file consists of lists of triangular facets. > ASCII protocol is superfluous. /everything/ else would immediately break. This is a historical reconstruction of the original 1989 STL specification. What you call "unsavory" behaviour of OpenSCAD is a standard procedure most software do when exporting stl. If you want to discard the disposable edges of the stl in Sketchup use the plugin Cleanup by Thomthom (http://sketchucation.com/pluginstore?pagecount=1&author=1149&listtype=1&currentpage=1&actualpage=Next+%3E). What I call unsavoury behaviour is the ability Sketchup has to destroy the topology when importing a healthy stl with a dense set of vertices. To confirm this just import any gear you find in Thingverse. To solve this you will need another plugin by Thomthom: Solid Inspector and a lot of manual work. The best way to import STLs into SketchUp is to first use an external utility (NetFabb Basic is fine) to make them 10 or 100 times larger than the original. Then SketchUp does not bother to "fix" the fine/detailed aspects of the model, and you do not have to use Cleanup or Solid Inspector. I then re-scale them back down when I'm done, sometimes in SketchUp, but sometimes using NetFabb Basic again. I tried Cleanup2 in Sketchup. Although it improved the model, it still left two co-planar facets on each face which DesignSpark treated, of course, as separate items. I still had to use DesignSpark's 'merge faces' capability. To unsubscribe from STL shows unwanted co-planar faces in SketchUp and DesignSpark, click here.